February 21, 2013 0 comments on "How to Decoupage a Table"
Decoupaging is the process of pasting cut-outs, most commonly made of paper to objects, then covering them with lacquer or varnish. This interesting type of decoration allows one to create an interesting appearance of depth, creating patterns, pictures and interesting combinations that look almost painted on the object. Working on a table will require a significant amount of resources, so keep that in mind. There is a wide range of materials you may use for decoupage, such as cards, wrapping paper, tissue paper, paper shopping bags, fabric, rice paper and specialized decoupage paper. Make sure you are using a soft and flexible paper so you can deal with curved sections of your table, if there are any. You can prepare the cut outs in a variety of ways, such as cutting them up, using them whole, tearing them and so on. The most important part of this is the designs and shapes of the pieces you have chosen. Using some scissors and a craft knife you’ll be able to get the job done. Keeping the scissors or knife angled slightly to the right side will help create a more bevelled surface for a better match. Create a sketch or a plan of your chosen layout, or alternately just place the cut-outs in your desired pattern. Photograph them so you’ll be able to remember how they are supposed to look in the final product. You have to ensure you are working with a dry and clean surface, filling out any gouges that may get in the way. Sand the surface of the table down if there are any imperfections and bumps. Refinishing or painting your table will have to be done before anything is pasted on it. Some materials, such as metal and wood may require a certain primer or some latex to allow a better adsorption rate. You can use white glue for the most part, though it would be significantly easier if you mix it with water in a 50/50 ratio. Just mix them in a jar, then close it up with a lid and shake well until the mixture is complete. Using a paintbrush, apply a thin layer on your target surface and the backs of your prepared cut-outs. Make sure you do it evenly, so they will stick well. Glue them to your table by laying them down carefully. Make sure you avoid any bending or crumpling as fixing it will be difficult and time-consuming. Smooth out the paper with your finger or a brayer, starting from the center of the cut-out. When you apply them, make sure they overlap at least partially so they can hide the surface underneath. Make sure every layer has dried completely before you apply the new one. This is the deal with both single and multiple layers you might use. You need to seal your newly-made decoupage with a few coats of your chosen sealant. 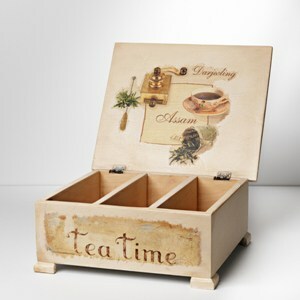 You can even buy special decoupage finish from hobby or art stores. Allow each coat to dry out completely before you apply the next. Use a very fine, 400 grit sandpaper to remove any imperfections from the surface. Use a cloth damp with water to get rid of the sanding residue. Avoid the sanding until you have applied enough coats to cover all surfaces well. You can only achieve the right appearance by doing so, as the sealant is very important. You can work with a different number of coats, ranging from only a few to the pretty staggering number of 40. Allow each coat to dry before you apply the next one. Follow my Home Decor board on Pinterest.